A new website enabling people to step out of their echo chambers and engage with bipartisan politics in the US – outside of the weakened mainstream media. Designed and built by Sticky this WordPress project is edited and published by Jon Saltzman. The registered owner of the site is Political Storm LLC of Philadephia. 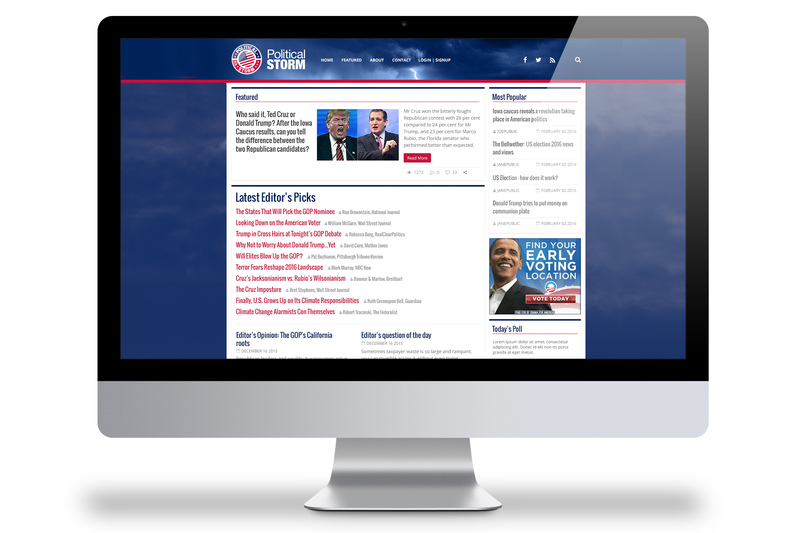 As well as adopting the aggregation model used by Drudge, which has become a huge driver on the web, Political Storm also produces original content and encourages users to generate their own content and share their opinions. The anti-echo-chamber bipartizan model of Political Storm aims to help people start and engage in political conversations about that issues that are important. The following is an overview of how the site came to life. Collaborating on ideas for the site. Initial ideas revolve around presenting trending news content based on a website hybrid between Twitter, Pinterest and Drudge. Content items to be presented in ‘bricks’ that link through to full content. Masonary layout could be the way to go. 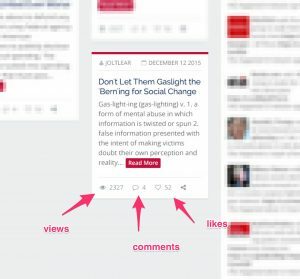 The main idea behind the new site is forming as a Pinterest for Political News. Featured contributors content will be highlighted in the Eye of the Storm section. 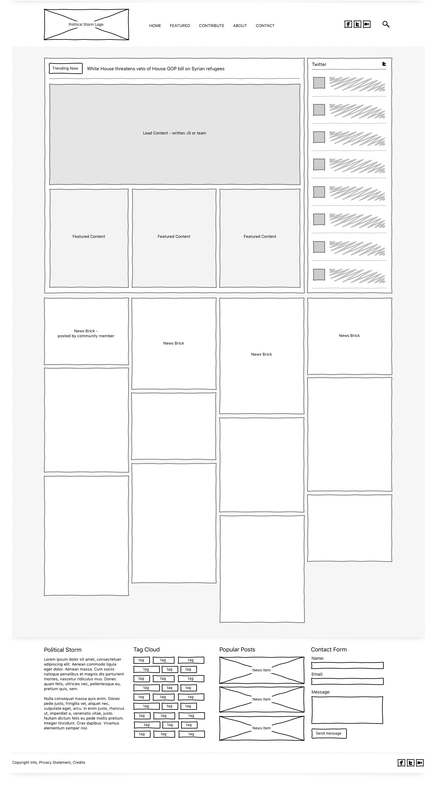 Popular content by vote and by views aswell as and content selected by the Editor will feature above the fold. A second section called Into the Storm with enable community members and bloggers to write and promote their own blog content on the site, and comment on content (registration required). With the wireframe agreed we begin to implement brand and consider typography, colour schemes, button colours and backgrounds – all in Photoshop as visuals. The header and primary navigation and considered and agreed. All is designed with retina screens in mind. We think detail. 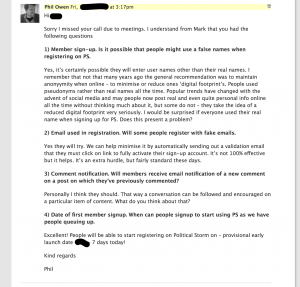 Using the online collaboration system MySticky we exchange ideas on how specific elements might work, security considerations, spam control, trolls, abuse, etc. MySticky makes communication really easy to follow. It introduces efficiency for each stage of the project and enables new members of team to get immediately up to speed. Sticky’s technical coding team use a third party code base to deliver a head start and project efficiency. All code is extensively tested on our staging servers before being released to the live cluster. Sticky provide webmaster services including Analytics, Adsense, Streaming Media, Video, AMP, Performance and error monitoring, Cloud cluster hosting and technical/user support. A 3rd party provider is responsible for code maintenance and changes, post launch. 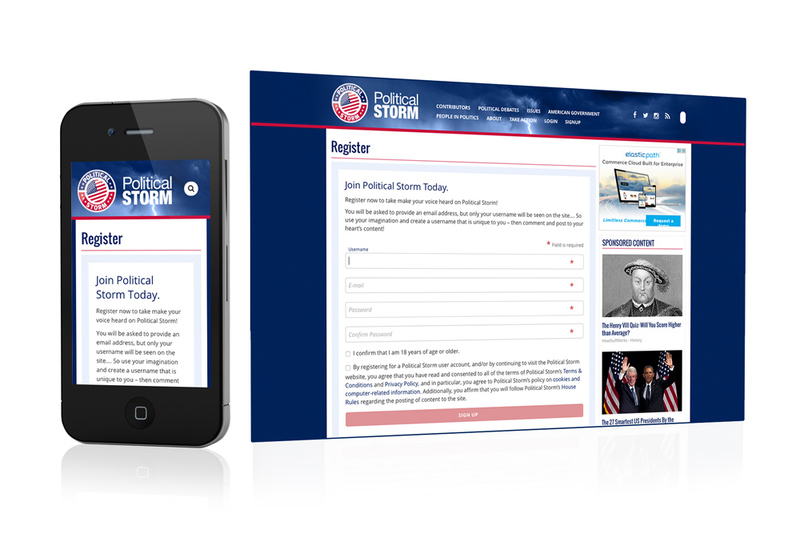 Political Storm is growing rapidly and has hundreds of thousands of visitors per month. An active social media scene and delivers live streaming channels of the largest political events.